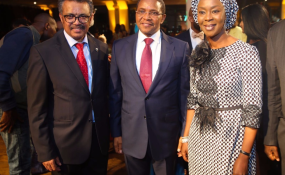 Abuja — H.E Mrs Toyin Ojora Saraki has been named as special advisor to the Independent Advisory Group (IAG) of WHO AFRO, the World Health Organization’s presence in Africa. Mrs Saraki’s first engagement in the new role will take place this week at the 3rd meeting of the Independent Advisory Group (IAG) in Johannesburg, South Africa. The meeting will focus on repositioning the work of the WHO in Africa in the context of the WHO’s 13th General Programme of Work (GPW13) and the global WHO Transformation Plan. "As Global Goodwill Ambassador for the International Confederation of Midwives, I particularly welcome the introduction of WHO AFRO's focused curriculum for the professional qualification education of Midwives and Nurses in Africa." “The experience I have gained as Founder-President of the Wellbeing Foundation Africa, working closely with our midwives on the frontline, as part of the global Every Woman Every Child Strategy to end all preventable maternal, newborn and child deaths, including stillbirths, by 2030, will inform my advice to the WHO."